Comfort reading is like comfort eating – minus the calories. From time to time I return to my bookshelf and pull out an old faithful friend. It has the same effect on me as eating a block of chocolate. It just makes me feel good. 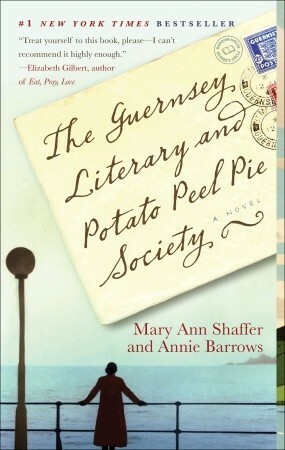 Now I can add a new book to my comfort reading list: The Guernsey Literary and Potato Peel Pie Society by Mary Ann Shaffer and Annie Barrows. My best friend gave me this book before she got on a plane to go back to her home overseas. “Read it, it’s good,” she said. I picked it up the other day and just meant to read a page or two. I ended up reading half the book! At first I wasn’t sure if I would like a book that is set out as a bunch of letters between numerous people. But it didn’t take long for me to warm to this format. Reading letters really draws you in and makes you feel closer to the characters. The book is set in Britain in 1946, a time when everyone is emerging from the horror of the Second World War. Writer Juliet Ashton is fresh off a book tour and hunting around for the topic of her next book. She corresponds with her publisher and friend Sidney and his sister, Sophie, through a series of letters and telegrams. Then she receives a letter from a stranger named Dawsey Adams. He is a pig farmer from the British Island of Guernsey and found her details written in the front of a second-hand book. He writes to ask where he can find more books from the same author. It is through the course of this correspondence that Juliet learns how the island was occupied by the Nazis throughout the war and how the Guernsey Literary and Potato Peel Pie Society came into being. Soon she is corresponding with a motley crew of islanders from a white witch who makes terrible concoctions, to an elderly farmer and a butler who impersonated a Lord throughout the occupation. What at first begins as an amusing correspondence quickly awakens the writer in Juliet. She learns that at the heart of all these stories is a remarkable woman named Elizabeth. The members of the literary society are waiting for Elizabeth to come home from wherever she was sent by the Germans during the war. As they wait, they are collectively taking care of Elizabeth’s small daughter, Kit. To tell you much more would be to spoil the natural and entertaining way this story unfolds. I never knew that the islands between England and France were occupied by the Nazis, nor what the islanders had to endure to survive the war. The stories tell of starvation, of sending children away for years to the mainland, of friendships and run-ins with German soldiers, and of years without any news from England. But mostly this is a story of finding light in dark places, of love and resilience, and of how books can unite people from all walks of life. Although some of the subject matter is heavy, it is written in a manner that doesn’t weigh you down. I’ve had this on my to read list for some time now. I must move it up and get it read this year. Thanks for the review. You’re welcome. It’s a nice, quick read. I hope you enjoy it. Give it a read. I hope you like it. One of my favorite books – thanks for the reminder. Thanks Rosemary, glad you liked it too. It’s a quick read. Def. give it a go! I love this book! It is such a lovely read. I’m always recommending it to people. My comfort read is, “I Capture The Castle” by Dodie Smith. I have read that book cover to cover I don’t know how many times. When I’m feeling stressed or lonely or sad, I pick up that book, flip to any page and I feel better instantly. Ah, the comfort of the comfort read! Great post! I haven’t read ‘I Capture the Castle’ but after your glowing endorsement I want to read it. You should! It’s such a wonderful book with such a strong female character. She was such a role model for me growing up. I ordered this book last week actually and know absolutely nothing about it so I’m very glad you wrote about. I’m really looking forward to reading it! Ah! You weren’t kidding – you did just read this book! Thanks for commenting on my post about it. Loved reading your thoughts, too.